Why do exchanges surfaces need to be large? In what way are organs designed to have large surface areas? Diffusion is used by cells to take in useful substances and remove waste products. It usually involves diffusion through a membrane, water movement by osmosis and also active transport e.g. gas exchange usually involves taking oxygen into cells for respiration and passing out carbon dioxide to the environment. Know and understand that many organ systems are specialised for exchanging materials. The ease with which an organism can exchange substances with the environment depends on the organisms surface area to volume ratio AND you can extend this idea to an organ itself e.g. the lungs. In single-celled microorganisms gases and dissolved substances can often diffuse directly into and out of the cell through the cell membrane. This is very efficient because a single cell has a large surface area to volume ratio membrane - large surface area relative to the volume of the cell. Therefore the single-celled organism has no trouble in exchanging sufficient materials with its environment. Know that the size and complexity of an organism increases the difficulty of exchanging materials. One reason for this increased difficulty in exchanging materials is that the distance from the exchange surface is getting further away from where the nutrients and oxygen are needed and the waste to be removed. Know that gas and solute exchange surfaces in humans and other multi-cellular organisms are adapted to maximise effectiveness - they don't have the obvious surface/volume ratio single-celled organisms have. Multicellular organisms have a smaller surface area to volume ratios compared to a single celled organism. This surface area is NOT sufficient to provide efficient rates of diffusion of substances in and out of the organism without significant adaptation through evolution - some examples are described and explained on this page. It is essential that the transfer processes of moving sugars, amino acids, oxygen etc. into cells and the removal of waste products, can happen as efficiently as possible. Therefore exchange surfaces have evolved to maximise the rate of transfer of wanted substances into, and unwanted chemicals out of, multicellular organisms. and lots of thin blood vessels to bring in essential molecules for life and carry waste molecules away eg the thin bronchiole tubes in the lungs. Animals have an efficient blood supply with lots of blood vessels including thin capillaries which have a particularly large surface to volume ratio - this allows fast diffusion in either direction. 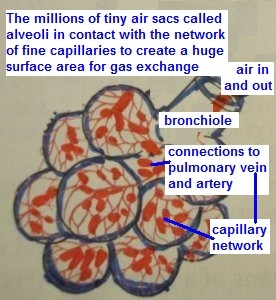 Animals need an efficient gaseous exchange ventilation system to take in (including oxygen) and give out air (including waste carbon dioxide) - in the lungs the tiny pockets called alveoli greatly increase the gas exchange surface. The larger a multicellular organism, the more difficult it is to exchange substances. Cells deep in the body are some distance to the surrounding environment - air or water. Larger organisms have low surface to volume ratio reducing exchange efficiency. Therefore, through evolution, instead of exchange through an outer membrane ('skin') multicellular organisms have developed specialised exchange organs including an equally specialised exchange surface. BUT, specialised organs are not enough on their own to serve a relatively large body, you also need specialised transport systems to convey substances to and from the body cells e.g. to provide nutrients or remove waste products. In animals the transport system is the circulatory system - blood vessels etc. and also gaseous exchange in lungs, the lengthy digestive system and the excretory system - and all systems must work in harmony with each other! In plants, transport is effected through the xylem and phloem vessels. See Transport and gas exchange in plants, transpiration, absorption of nutrients etc. The greater the surface area the greater the possible rate of material transfer. The most compact shape to give the lowest surface area/volume ratio is a sphere, but that's not very practical for the working of many specialised cells, tissues or organs - but very good for single-celled organisms! However, systems in living organisms that involve transfer of substances, do need as large a surface area as possible within the volume the 'system' occupies. To this end, many organs have evolved to give the maximum surface area as possible within the volume the 'system' occupies. You can see clearly that the smaller (thinner etc.) the 'system' or parts of the 'system' the greater the surface to volume ratio. Good examples of this are the millions of tiny air sacs (alveoli) in the lungs and the thin multi-layered sections of gills in fishes - both of which are to do with animal respiration. Examples of exchange systems are now described in detail with diagrams. The lungs are the means of transferring oxygen from air to the blood stream (blood plasma) and to remove the waste gas carbon dioxide. The surface area of the lungs is greatly increased by the alveoli - millions of tiny air sacs of the end of the tiny bronchiole tubes in the lungs where the gas exchange by diffusion takes place. Know and understand that the lungs are in the upper part of the body (thorax), protected by the ribcage and separated from the lower part of the body (abdomen) by the diaphragm. 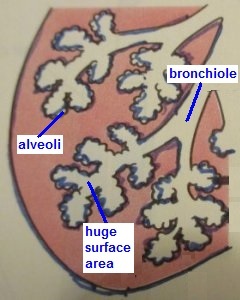 You should be able to recognise these structures of the lungs on the diagrams above and on the right. The ribcage physically protects the lungs from being easily crushed and damaged. To increase the efficiency of gas exchange in the lungs the bronchus divides in two (the bronchi), so each lung gets a good supply of air. Each bronchus divides and divides into many bronchioles with a tiny sac at the end of each one - the alveoli - which considerably increases the area for oxygen and carbon dioxide gas exchange. Know and understand that the breathing system takes air into and out of the body so that oxygen from the air can diffuse into the bloodstream for respiration, and waste carbon dioxide from respiration, can diffuse out of the bloodstream into the air. This gas exchange happens in the lungs which has millions of tiny air sacs called alveoli at the ends of the finest bronchiole tubes - a large surface area for gas exchange. Surrounding the alveoli are many small arteries (fine capillaries) bringing a good supply of 'dark red' deoxygenated blood to the lungs - the thin walls of the fine capillaries of the small arteries mean a short distance to enable faster diffusion rates for the gases. The gas exchange occurs on the moist membrane surfaces of the alveoli and the fine blood vessels - the moisture in the membranes is good for dissolving gases and increases the rate of gaseous diffusion. When the blood from the rest of the body arrives at the alveoli in the lungs it contains a relatively high concentration of carbon dioxide and low concentration of oxygen. This maximises the diffusion concentration gradients for the gas exchange i.e. 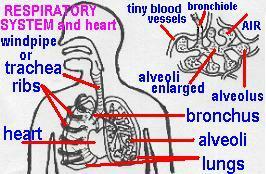 the blood to absorb fresh oxygen from the alveoli and the expulsion of carbon dioxide from the blood in breathing out. Therefore the oxygen diffuses out of the air into the blood capillaries of the alveoli (from high to low concentration) and carbon dioxide diffuses out in the opposite direction from the blood to the air in the lungs (again, from high to low concentration). So, oxygen, from breathing in, is transferred from the air in the alveoli into the fine veins which carry the 'bright red' oxygenated blood away to where it is needed in the rest of the body. 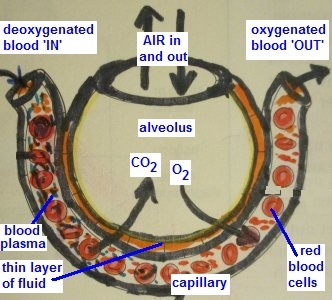 Simultaneously carbon dioxide diffuses in the opposite direction, from the deoxygenated blood into the alveoli and breathed out. The alveoli are well designed by evolution to perform this gas exchange efficiently. and an excellent blood supply of numerous tiny blood vessels - vein and artery capillaries. Know and understand that to make air move into the lungs the ribcage moves out and up and the diaphragm becomes flatter. Know these changes are reversed to make air move out of the lungs. Know the movement of air into and out of the lungs is known as ventilation. You should be able to describe the mechanism by which ventilation takes place, including the relaxation and contraction of muscles leading to changes in pressure in the thorax. As you breathe in, the intercostal muscles contract expanding the rib cage, and the diaphragm also contracts making it flatter, both of which increase the volume of the thorax. This has the effect of decreasing the pressure in the lungs and allowing air to be easily drawn in, the air will flow in naturally, due to the pressure difference between the air in the lungs (lower pressure) and the 'outside' air (higher pressure). In breathing out, the intercostal muscles relax (ribcage contracts), the diaphragm relaxes and moves up, so the combined effect is to increase the air pressure in the lungs and air is expelled. Artificial ventilators move air into and out of a persons lungs, where they cannot work unaided. This may be because some injury or medical condition or undergoing an operation, which prevents them from breathing normally. This used to be done by a large 'capsule' called an 'iron lung' which encased the whole body of the patient except for the head. The pressure in the capsule is mechanically lowered to allow the lungs to expand and take in air and then raised to make the lungs contract and expel air. However the blood flow in the lower part of the body can be poor and giving rise to poor circulation side effects. Modern ventilators work by pumping air in a go/stop cycle, using a mouth piece connection, directly into the lungs to expand them and push out the ribcage. When the pump temporarily stops, the ribcage relaxes, contracting the lungs and expelling the air. This is a much more convenient method with a wide range of applications, and, it doesn't interfere with the body's blood supply, but there can be problems if the alveoli (may burst) can't cope with the artificially increased air supply. Fish have a single circulatory system in which deoxygenated blood from the fish's body is pumped to the heart, which then pumps it through the gills to absorb oxygen from the water and round through the rest of the body in one continuous loop - just one circuit in operation (unlike the double circulatory system of mammals). 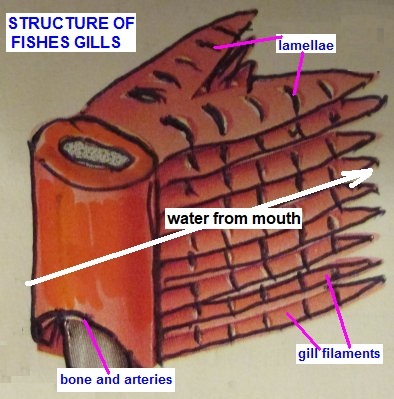 Gills are the gas exchange system in fishes and the structure provides a large surface area for oxygen to be absorbed into the blood stream and waste carbon dioxide passed out. Water, containing dissolved oxygen, enters the fish through its mouth and passes out through the gills. In the gills, oxygen diffuses from the water to the blood, simultaneously, carbon dioxide diffuses from the blood into the water. To make the gas exchange process as efficient as possible, the surface area of the gills is greatly increased by the presence of lots of thin plates called gill filaments. The surface area is increased even more by lots of tiny thin tissues called lamellae (plural of lamella). The lamellae of lots of blood capillaries, increasing the contact area to speed up the diffusion of gases - oxygen or carbon dioxide. The lamellae also have a thin layer of surface cells to minimise the gas diffusion distance. The blood flows through the lamellae in one direction and water flows over them in the other direction and this produces a continuous high concentration gradient between the blood and water. The concentration of oxygen in the water is always higher than its concentration in the blood so maintaining a good supply of oxygen to the blood by diffusion from the water. I presume the concentration of carbon dioxide is higher in the blood than in the water, so the waste gas is continually diffusing out of the blood? 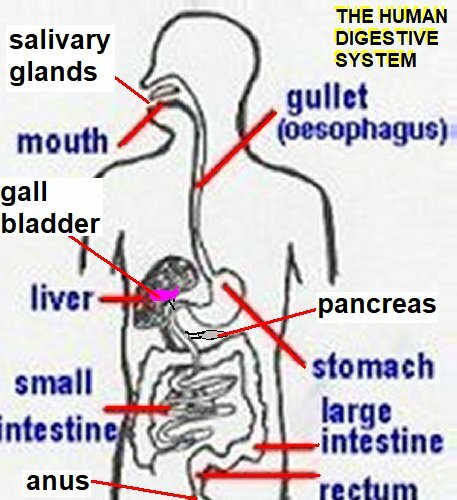 The small intestine is where dissolved digested food particles are absorbed from the digestive system into the bloodstream to supply the cells with the necessary nutrients. The transfer through the partially permeable membrane might be by 'natural' diffusion down a diffusion gradient or by active transport against a diffusion gradient. The partially permeable membrane regulates the transfer of substances. The efficiency of the process is considerably increased by the structure of the small intestine ..
Know and understand that the villi in the small intestine provide a large surface area with an extensive network of thin blood capillaries to absorb the products of digestion by diffusion and active transport. The tissue lining in the small intestine is covered with millions of protuberances called villi, which poke up from the intestine surface into the partially or wholly digested food /mush'. 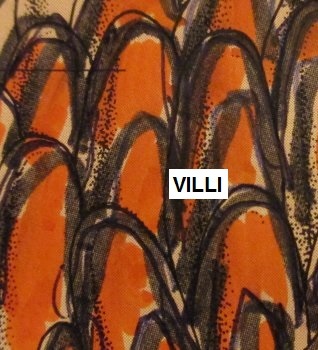 The villi consist of a single layer of cells (thin) on the very large surface area of the intestine. Both factors considerably speeds up the food absorption process. 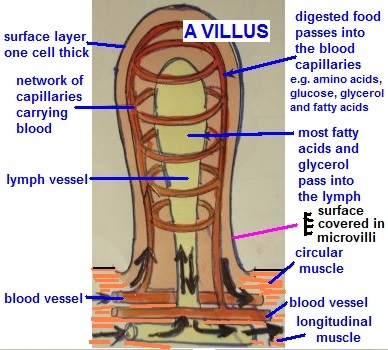 Each villus (of the millions of villi) has single layer of surface cells and each villus contains a multitude of fine blood capillaries into which the small digested food molecules can rapidly diffuse and be absorbed into the body. A good blood supply is needed to efficiently carry the digested food away to where they are needed. When there is a higher concentration of glucose in the intestine than in the bloodstream, glucose molecules will naturally diffuse into the blood stream down the diffusion gradient (concentration gradient from higher to lower concentration). However, if there is a lower concentration of glucose in the intestine, your body still needs glucose for respiration, therefore active transport must be deployed. This uses energy in such a way as to transfer glucose molecules from the intestine against the natural concentration (diffusion) gradient.